RUTLAND — As has become a tradition in the Rutland Twp. 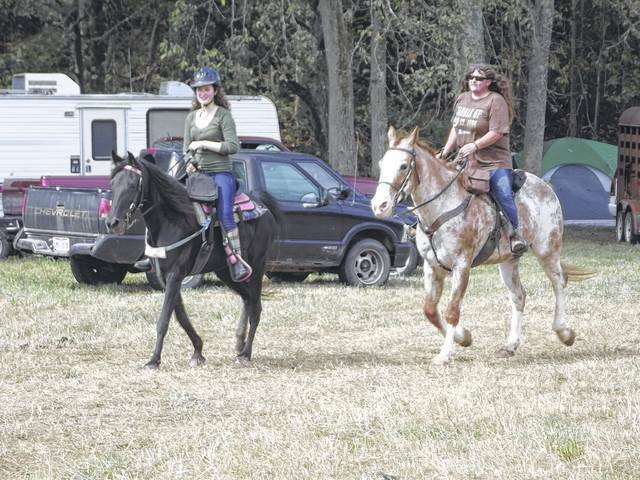 area of Meigs County, the third Saturday of September marks the annual St. Jude Trail Ride at the Dill Farm. For the past 21 years, riders and their horses have gathered at the family’s farm for a day of riding, fun and food with the proceeds benefiting St. Jude Children’s Research Hospital. Saturday will mark the 22nd annual event held at the farm on Beech Grove Road near Rutland. The event brings riders from around the region and sometimes states away to take part and raise money for the cause. Over the past 21 trail rides, more than $250,000 has been raised through the event, including $18,836 in 2016. There were 208 riders registered for the 2016 event. Isabel and Mike Dill, along with other friends and family, have organized the annual event which has grown over the years to a multi-day event which includes camping and events on both Friday and Saturday. Camping is available at the ride site and Friday evening will include music with a DJ sponsored by the Ohio Horse Council. Registration begins at 9 a.m., and the ride will leave at noon on Saturday, Sept. 16, taking participants along a 10-mile trail through the wooded hills of the area. Everyone is welcome to “saddle up” and take part in the ride with whatever donation they want to make as their registration fee, with all proceeds going to St. Jude. While registering for the ride, those in attendance can signup for door prizes, as well as purchasing 50-50 and raffle tickets. The drawings, a hog roast, hot dogs and bean dinner will be held following the ride. There will also be prizes for the top 3 money collectors for the event. For those interested in the trail ride, just show up for registration on Saturday. The Dill Farm is located at 34015 Beech Grove Road, Rutland. Just follow the GPS and look for the horses. Also, Isabel can be reached by calling 740-742-2849 or email her at isabeldill@hotmail.com.